How do you make sorbet? Sorbet is a combination of cooked fruit or vegetables mixed with some liquid and a little sugar. With fruit you can get away with not cooking it, but something hard like beetroot is better cooked first. You can make sorbet in an ice cream maker or by hand. If you have an ice cream machine, the fruity mix is added to the frozen bowl and churned until it has thickened. You can eat it soft set straight from the bowl or pop it into a tub to set in the freezer, then take it out when you are ready to serve it. Once your fruity mixture is ready, pop it in a tub in the freezer. Now comes the hard work. You have to take it out every half hour for 3-4 hours to whisk it up with a fork to break up the ice crystals. A bit more labour intensive, but well worth the effort. Like ice cream, once sorbet has sat in the freezer for a while it is sets rather hard. Take it out of the freezer and pop it in the fridge at least 15 minutes before you need it then fill a bowl or jug with boiling water and dip your ice cream scoop in it before scooping. It will cut through the sorbet like butter. This recipe comes from the most gorgeous cookbook called veggie desserts + cakes by my good blogging buddy Kate Hackworthy. 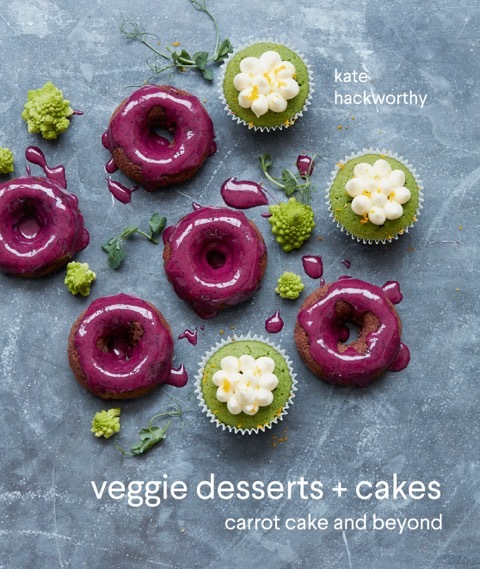 Kate has been blogging her veg inspired recipes over at Veggie Desserts for the over 4 years now. I instantly loved her recipes when I stumbled over her blog a few years ago and soon got to know her online and realised she was such a nice person too. We've only met in person once at a food blogging conference, but I hope we we'll meet again before too long. I instantly thought her recipes should be in a cookbook and knew it was only a waiting game until she was discovered and here we are. Veggie Desserts + Cakes is full of vegetable packed cakes, desserts and other sweet treats and we're not just talking about carrot cake. There's waffles, cinnamon rolls, doughnuts, pies, tray bakes, iced treats and pastries using every vegetable imaginable. In some of the recipes she replaces butter with avocado and eggs with vegetable puree. It's all very inspired and droolworthy. Just the inspiration you need if you are looking to increase your daily vegetable intake or you want to offer your kids healthier sweet treats. The sweet, earthy beetroot flavour isn’t masked in this sorbet, rather it shines alongside the vanilla. 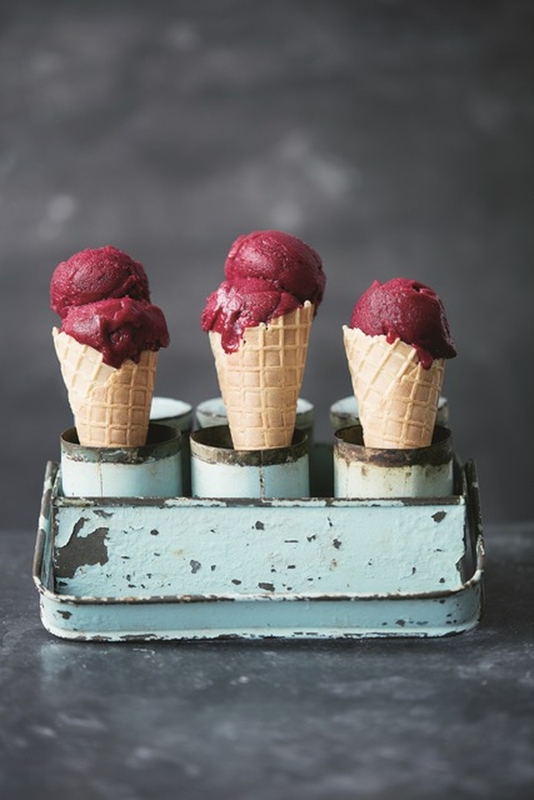 It makes a refreshing and eye-catching dessert – with its vivid purple colour – a dinner party palate-cleanser, or lovely in a cone on a hot summer’s day. This sorbet is particularly easy to make in an ice-cream maker, but you can use a dish in the freezer if you don’t have one. Purée the beetroot with a hand blender until smooth, then set aside. In a small saucepan over a medium-low heat, combine the sugar and water, stirring occasionally until completely dissolved. This could take about 5 minutes. Remove from the heat and leave to cool slightly. Disclosure: The publisher sent me out this cookbook and gave me permission to share this recipe. I was not expected to share a positive review and any opinions expressed are my own. Yes, although I am always up for sorbet or ice cream. And yes about time too. No problem Kate and yes that would be great. I look forward to it. These look just stunning (as does everything in Katherine's) book. I have never made my own sorbet, but this looks like the perfect way to start. I love the colour. It's simple to make. I used to make it a lot when I had a bigger freezer. Corrr, don't they looks gorgeous? It's absolutely freezing down here but I would still dive into a scoop of two of that sorbet in a heartbeat! Me too, it does look gorgeous. Wow the colour of that sorbet is amazing, I could just eat it now. Bet it works really well with a chocolate beetroot cake! This is just so tempting. Gonna try it this Saturday.